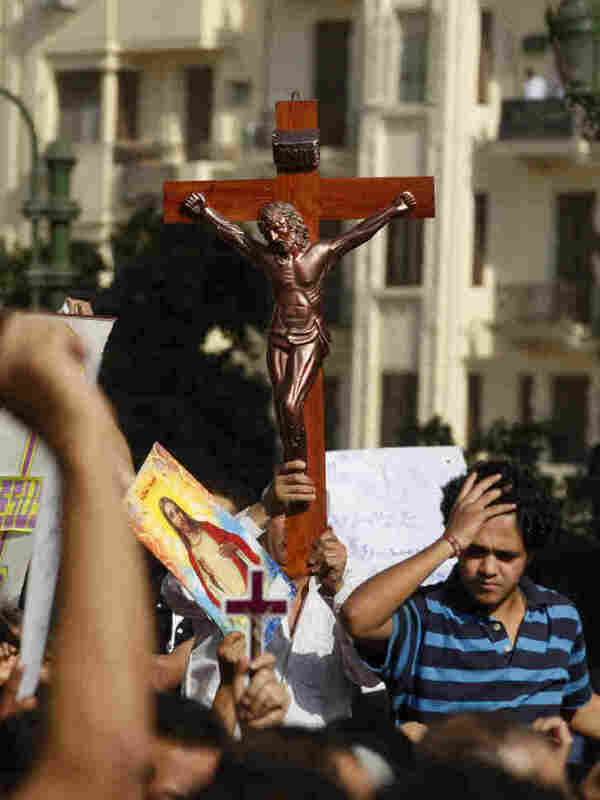 After Deadly Clashes, Egypt's Christians On Edge Over the weekend, an outburst of violence between Coptic Christians and Muslims killed at least a dozen people in Cairo. Since the revolution, experts say, attacks against the country's Christians have grown more severe. In Egypt, the army is guarding two Christian churches that were burned over the weekend in an outburst of violence between Coptic Christians and Muslims. The clashes in Cairo left at least a dozen dead and hundreds injured. The Copts make up about 10 percent of the country's population, and many say they feel more vulnerable to attacks by Muslims since the fall of Hosni Mubarak in February. 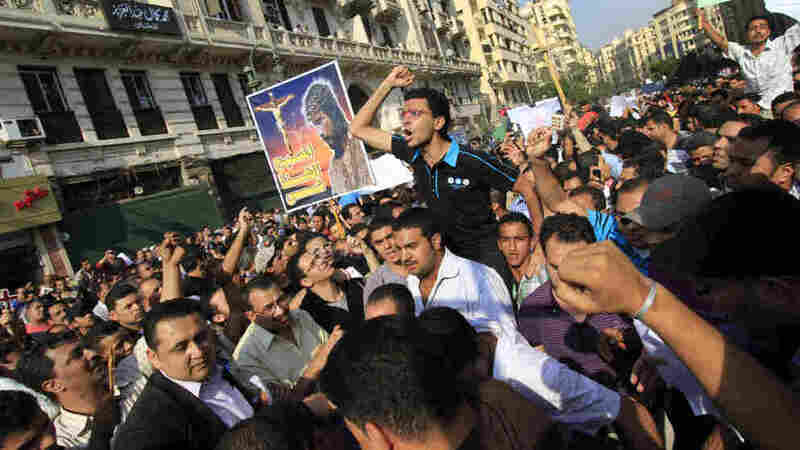 In the neighborhood of Imbaba, an angry crowd of Coptic Christians has gathered outside a police station. They're identifiable in part by the small crucifixes some have tattooed on their hands and wrists; on Sunday, some were also freshly bandaged after Saturday night's violence. One word constantly repeated in this crowd is "fitnah," or religious strife. But Christians were hardly the only victims. Just a few blocks away, Tahrir hospital received seven of the dead and treated about 50 of the injured, like Ahmend Magdi Ahmed, a young Muslim with a gunshot wound to the leg. "I ran across a group of Christians with automatic weapons," he says, "and they were just shooting people." The trigger for the violence appears to have been a rumor that a Christian woman who had converted to Islam had been abducted and was being held inside a church. Similar stories have caused violence before. Still, Egyptians are worried about where things are going. "There is a sense of shock," says Hossam Bahgat, executive director of the Egyptian Initiative for Personal Rights, a nongovernmental organization. He says he doesn't think there have been more incidents of violence since the revolution, but he says, he thinks they are more severe. The attacks include destroyed churches, murder and mutilation. "There is generally a sense of increased boldness of extremist elements in society that are attempting to intimidate Christians," he says. Copts are especially wary of those who call themselves "Salafists" — devout Muslims who believe that Egypt should have a pure Muslim identity. Bahgat says that since the revolution, extremists have felt freer rein. "They know that the police officers will not rush to use violence against them because of the hostility that the people on the streets generally feel towards the police," he says. On Sunday, the military government tried to remedy that impression. Speaking on television, Justice Minister Mohamed el-Guindy invoked the spirit of Muslim-Christian solidarity that was so visible during the Tahrir Square revolution. "The people of Egypt, the brave police and the great army are joining forces as a protective shield against the counterrevolution," Guindy said. In the name of protecting the revolution, the military says, it's cracking down. Officials say they've arrested 190 people and will make them face military trials. But for Coptic Christians, this isn't enough. On Sunday night, thousands of Copts barricaded a street along the Nile. They chanted, "Hey Tantawi, where are you? The Copts can't find you!" — a reference to Mohamed Hussein Tantawi, the head of the ruling army council. Ihab Samir, a middle-aged Copt who has spent time in New Jersey, says the revolution has let hatred for Christians out into the open — and the Copts have to take a stand. "We don't want the violence to go on," he says, "and if it continues on, then there's going to be thousands and thousands more Copts coming to this place, to say, 'We exist.' "
There are signs that Egyptians still feel the solidarity expressed during the revolution. Some Muslims even came to the Copts' protest, including women in headscarves, and men like Walid Muhammed. "I am an Egyptian Muslim," he says. "And I do not accept a Christian or a Muslim to be insulted in this country."